Primarily consisting of players from Charlotte HS in Punta Gorda as well as a few neighboring add-ins, the Swish competed well. Their main player of note was 6’4 guard Ahmad Johnson. He played a lot on the ball but seemed most comfortable when relived of ball-handling and offense-initiating duties. After a slow start, his shot started falling from the perimeter, which opened up other scoring opportunities. Johnson proved adept at coming off ball-screens, recognizing his options, and making the right play. Also of note for the Swish was 6’4 Brandon Gainey out of Port Charlotte. Exceptionally athletic, he excelled when able to get out in transition or get up for lobs and/or offensive rebounds. Gainey’s jumper isn’t bad either, going 1-2 from distance in the game we watched. The guard trio of Luis Pacheco, Jonathan Nunez, and Isaad Solano stood out for the program from Miami-Dade County. At just 5’9, Pacheco is a mighty mite that shoots the ball well from deep, gets into the lane and breaks down the defense, and is fierce competitor at the defensive end. Nunez was described by one coach as a “bulldog” and the tenacity of his play proves that. While he struggled a bit shooting the ball from deep, it didn’t impact the rest of his approach to the game. The 6’2 Nunez come away with plenty of offensive rebounds, was first to several loose balls and long rebounds, and took on the challenge of defending the other team’s best perimeter player. Solano, 6’4, can be considered the top scorer of the group. He shot the ball well from the perimeter and found ways to get past the defense and score at the basket. He often beat out bigger defenders to offensive rebounds and was quick to beat the defense down the court in transition. A trio of players from University Christian School in Jacksonville caught our attention playing for the Magic. Only a junior, rising 6’6 junior Linzy Hancock was effective as a passer from the high post. He showed nice court vision and touch in delivering the ball to cutters. He also knocked down fifteen footers when the defense played soft and then scored after a dribble or two to get to the basket when the defense challenged that shot. G’Shan Aldridge, a 5’9 guard, pushed the pace, got others involved, and made the most of his scoring opportunities. Athletic Denzel Wiggins, a 6’4 wing, benefitted most from the game being played at an up-tempo pace. He finished with body control and touch in a crowded lane, helped at both ends in the rebounding department, and connected on perimeter shots when left open. A standout for the KT Kings out of South Florida was 6’7 forward Makerere Williams of Dillard High School in Fort Lauderdale. He’s got a nice offensive game from fifteen feet and in as he makes jumpers, scores after a couple of dribbles from inside the arc and has quick moves when he sets up on the block. He’s a quick leaper than challenges shots and usually beats opponents to rebounds. Based out of Central Florida, Raptors Elite competed well against some of the more high-profile teams in the event. A big surprise was 6’8 Deatrick Pashell from Cypress Creek. While he did no one thing great, he was more than acceptable when it came to running the floor, protecting the basket, and using basic moves inside to score. He’s far from a finished product and his best basketball is ahead of him. We were caught off-guard by the shooting prowess of 6’2 Deomondre Rock from Edgewater HS. He connected on 5-8 shots from beyond the arc in front of several college coaches that were watching the game more for the players on the opposition. That kind of shooting will get a player noticed. We mentioned the play of Yves Fleuranvil during the event as one of our breakout players. Another SFL Elite player of note was 6’4 wing Floyd Rideau. He shot the ball well off the catch outside the three point line, finished above the rim and got some stickbacks over bigger players inside. Rideau moves his well on the defensive end and anticipates in the passing lanes well. This group got significant contributions from 6’4 Tyrus Jackson from Sarasota Riverview and 6’9 Simon Wilbar from Fort Myers Canterbury. Jackson proved the be an energetic wing as he made hustle plays, snared offensive rebounds, and guarded people maniacally on defense. He made open perimeter jumpers but didn’t hesitate to attack the basket if a lane opened up. Wilbar made a few three point shots on his own which didn’t surprise us but to his credit he didn’t just float around on the perimeter. He posted up and scored a couple of times with a jump hook in the lane. Wilbar also played more physically on defense and was more aggressive in pursuing rebounds than we’ve seen in the past. Playing a pair of showcase games against teams from high profile shoe-sponsored circuits, Wade Elite competed well. Emmanuel Onuama, a 6’10 center from Cardinal Newman in West Palm Beach, was a force in the middle. He rebounded well at both ends, keeping the ball high away from opposing guards that looked to come in and strip. Onuama was quick to get the ball back up and in when he grabbed misses from teammates. A couple of basic post moves give him an ability to score when not played physically by the defense. Johnnie Williams, a 6’4 wing from Sarasota Booker, had an outstanding game on Saturday against the NY Lightning. Not regarded as a shooter, he connected on 6-8 from deep on his way to 22 points. Always a top-shelf athlete and force when taking the ball to the basket, he’s ability to shoot the basket from the perimeter to keep the defense off balance is key to his basketball future. 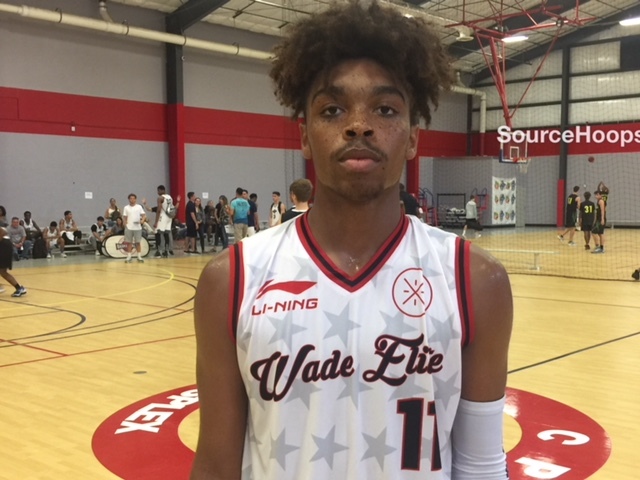 Gabe Taylor, a 5’10 guard in the class of 2020 certainly deserves props for his play for Wade Elite. A good outside shooter, he uses that weapon to force the defense to overplay him. At that point, he can use his quickness to get to the basket, breakdown the defense, and get his teammates easy shot opportunities. To no one’s surprise, Taylor Trudeau, a 6’3 guard from Mount Dora Christian, shot the ball well from deep for Team Hustle Adidas. His range extends well past the high school three point line and should the defense step off even the tiniest bit, Trudeau makes them pay. He is improving as a driver and scorer at the basket but the three-ball will always be his calling card. Also playing well for the team was 6’4 wing Devante Gilbert out of Timber Creek. Athletically, he’s one of the better ones around. A terror in transition, Gilbert finishes well above the rim. He’s also an active rebounder at both ends and puts in work when defending the basketball.